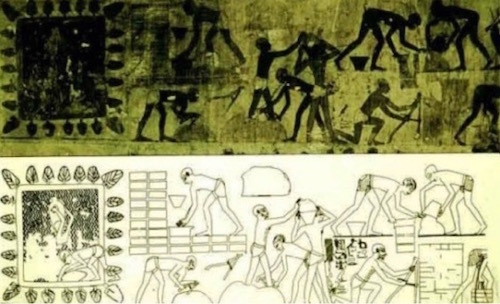 Wall relief showing Semitic laborers in Egypt making bricks with clay and straw (15th Century BC). Top shows the original; bottom shows a reproduction. The hieroglyphs on this wall painting read: “captives whom his majesty brought for the works of the temple of Amon” and “the taskmaster says to the builders: ‘The rod is in my hand; be not idle.’” Other Egyptian texts mention brick quotas and a lack of straw, just as Exodus 5 does. The Hebrews had been in slavery in Egypt for four hundred years. God sent them a man, Moses, who would lead them out of slavery and into The Promised Land. 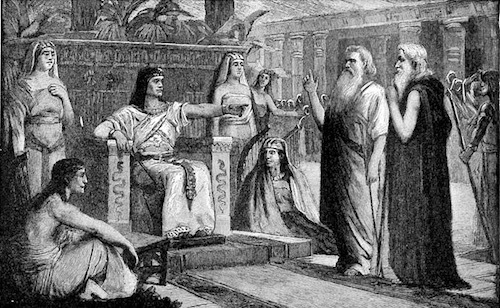 But Pharaoh was stubborn and would not let his free labor force go. The historicity of the Exodus from Egypt is a seminal belief among Jews, Muslims and Christians. 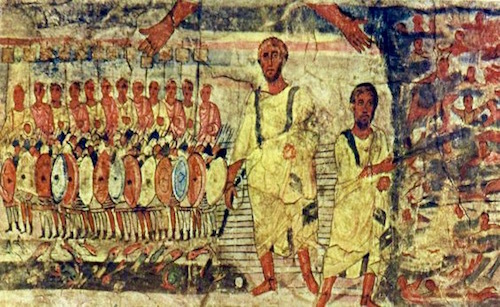 There is disagreement among some about the date of the Exodus (1400’s or 1200’s), but none doubt the Exodus as an historical fact. 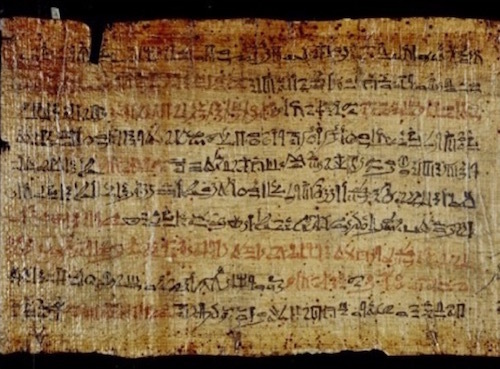 A papyrus (below) was discovered in Egypt in the early 1800’s called the Ipuwer Papyrus. It is in the Dutch National Museum of Antiquities in Leiden, Netherlands. The dating of the Papyrus is difficult. Some date it to the 1900’s BC, others to the 1500’s BC. Others say it is a copy or a copy of a copy made centuries earlier and still others claim it was written by a man who was an eye-witness to this destruction of Egypt. IPUWER 2:5-6 Plague is throughout the land. Blood is everywhere. 3:10-13 That is our water! That is our happiness! What shall we do in respect thereof? All is ruin. 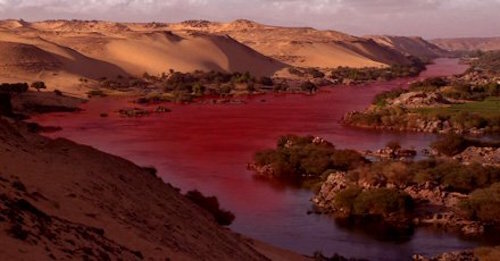 EXODUS 7:20 …all the waters of the river were turned to blood. 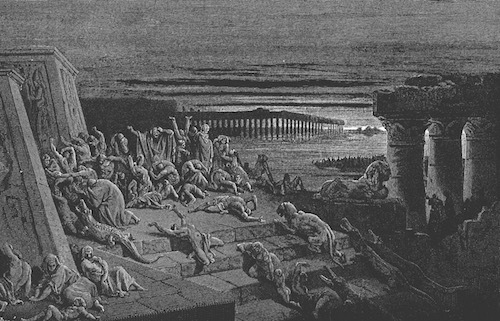 7:21 …there was blood throughout all the land of Egypt …and the river stank. IPUWER 2:10 Forsooth, gates, columns and walls are consumed by fire. 5:12 Forsooth, that has perished which was yesterday seen. The land is left over to its weariness like the cutting of flax. EXODUS 9:23-24 …and the fire ran along the ground… there was hail, and fire mingled with the hail, very grievous. 9:31-32 …and the flax and the barley was smitten; for the barley was in season, and flax was ripe. But the wheat and the rye were not smitten; for they were not grown up. 9:2-3 Behold, cattle are left to stray, and there is none to gather them together. 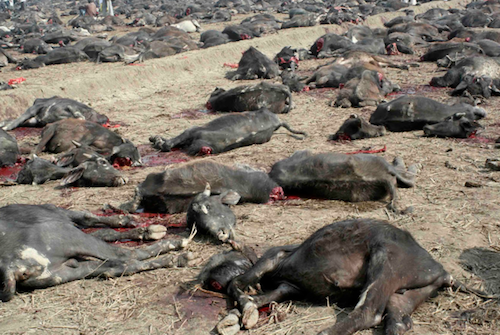 EXODUS 9:3 …the hand of the Lord is upon thy cattle which is in the field… and there shall be a very grievous sickness. IPUWER 9:11 The land is without light. EXODUS 10:22,23 And Moses stretched forth his hand toward heaven; and there was a thick darkness in all the land of Egypt three days: They saw not one another, neither rose any from his place for three days: but all the children of Israel had light in their dwellings. 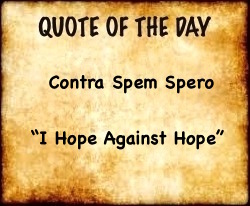 IPUWER 4:3 (5:6) Forsooth, the children of princes are dashed against the walls. 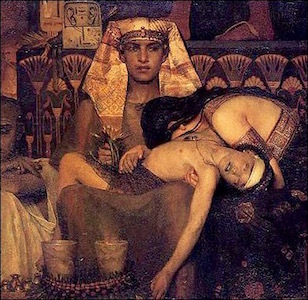 EXODUS 12:29 And it came to pass, that at midnight the Lord smote all the firstborn in the land of Egypt, from the firstborn of Pharaoh that sat on his throne to the firstborn of the captive that was in the prison. IPUWER 7:1 Behold, the fire has mounted up on high. Its burning goes forth against the enemies of the land. EXODUS 13:21 … by day in a pillar of cloud, to lead them the way; and by night in a pillar of fire, to give them light; to go by day and night. IPUWER 3:2 Gold and lapis lazuli, silver and malachite, carnelian and bronze… are fastened on the neck of female slaves. 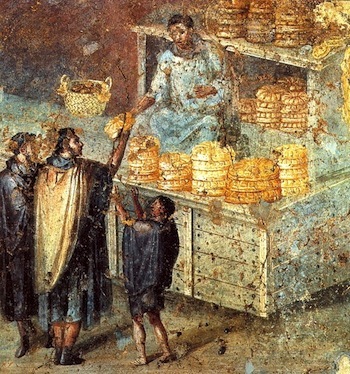 EXODUS 12:35-36 …and they requested from the Egyptians, silver and gold articles and clothing. And God made the Egyptians favor them and they granted their request. 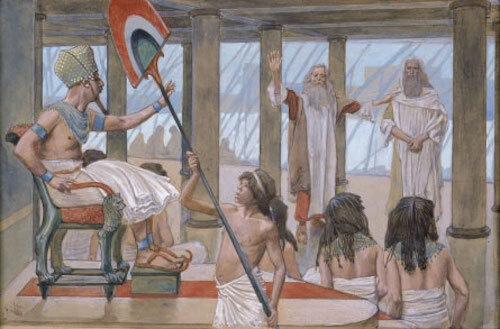 [The Israelites] thus drained Egypt of its wealth.